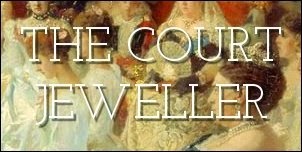 Queen Mary's wedding presents included a number of important pieces of jewelry. We've talked a lot about the tiaras in that particular haul here already -- including the magnificent Girls of Great Britain and Ireland Tiara and one of my favorites, the Iveagh Tiara -- but the gifts included other pieces as well. Today, we're looking at a lovely smaller piece from the collection of gifts: the Women of Hampshire Brooch. The brooch was one of the gifts given to Mary by a committee of women. This time, the group was made of women who lived in the county of Hampshire. The committee was chaired by an important aristocratic lady: Elizabeth Wellesley, the Dowager Duchess of Wellington. Elizabeth was the daughter of a marquess and the daughter-in-law of the famous 1st Duke of Wellington, the hero of the Battle of Waterloo. She also served as Queen Victoria's Mistress of the Robes, so she was used to moving in royal circles. The committee selected a piece of diamond and pearl jewelry with a floral motif from Garrard for the present. Initially, the piece was designed to be worn as a pendant on a necklace, but Mary later had it converted so that it could be worn as a brooch. It has a distinctive shape with three pendant stones: two pear-shaped diamonds and a large pear-shaped pearl. The brooch was among the jewels inherited by the present Queen when her grandmother, Queen Mary, died in 1953. Since then, it's become part of the Queen's daytime brooch rota, popping up now and again at various royal engagements.